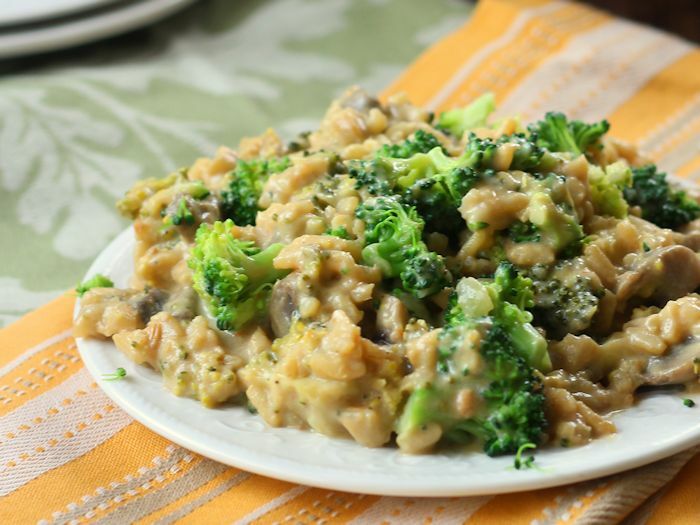 This 100% plant-based and junk food free vegan broccoli cheese casserole will knock your socks off! Serve it in place of your favorite traditionally non-vegan side this year. Nobody will know it’s vegan! Mom, I did it! I veganized our dirty little Thanksgiving family secret. I’m bringing this version this year. You’re going to love it. Don’t tell Dad and everything will be just fine! Everyone else, a little explanation: my family doesn’t normally do the traditional Thanksgiving green bean casserole. Nope, we discovered something much worse. It’s a broccoli dish that we refer to as a “casserole” even though it’s not actually baked in the oven. By “way worse” I mean loaded with the most processed ingredients you can think of, including a bottled cheesy saucy that might not have any actual cheese in it, come to think of it. That would make sense, given the fact that this dish was way easy to veganize. So, what exactly is this stuff? Like I said, it’s not baked in the oven, so it’s not a casserole. My husband disagreed with my decision to call it a “stew,” so I’m sticking with casserole, even though it’s not. Now, I’m not going to lie. The original, uber-processed, super classy version of this dish is something I think we, in my family, all hated to love. There’s a reason it became a tradition we haven’t been able to shake since the mid-eighties. It’s frighteningly addictive. How does the vegan version stack up? Amazingly! Seriously, it was delicious, shockingly cheesy, and maybe just as addictive as the original, with one difference: I felt way better after downing a full plate of this version. It’s every bit as tasty, just cleaner. 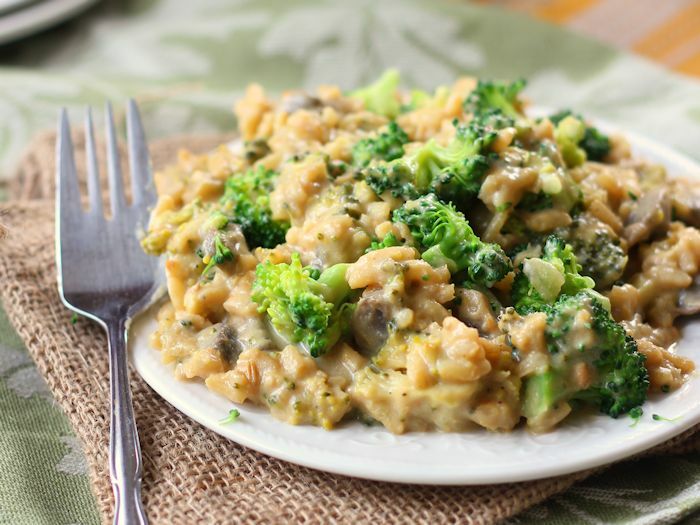 With broccoli, rice and mushrooms in a cheesy base of potatoes, carrots and dairy-free milk, you could even get away with making a meal of this stuff. 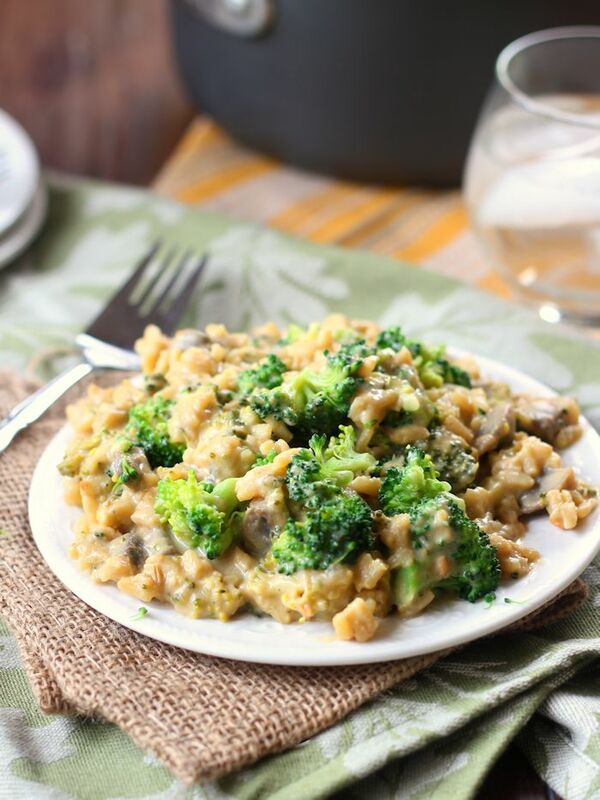 This 100% plant-based and junk food free vegan broccoli cheese casserole will knock your socks off! Serve it in place of your favorite traditionally non-vegan side this year. Nobody will know it's vegan! Place potato and carrots into a medium saucepan and cover with water. Bring to a boil. Lower heat and allow to cook at a low boil until tender, about 15 to 20 minutes. Remove from heat and drain into a colander. Transfer to a food processor and blend until completely smooth, stopping to scrape down sides of bowl as needed. Coat the bottom of a large pot with oil and place over medium heat. Add onion and sauté until softened, about 5 minutes. Add garlic and cook 1 minute more. Add mushrooms, in as even a layer as possible, and allow to cook until slightly browned, about 5 minutes. Add broth and rice to pot. Stir to incorporate. Raise heat and bring to a simmer. Cover and allow to simmer until rice is fully cooked, about 45 minutes. There should be some liquid remaining in the pot when rice is finished cooking. Uncover pot and stir in potato mixture, broccoli, nutritional yeast, lemon juice and miso, if using. Thin with about 2 cups of milk, using a bit less if mixture seems too thin, more if it seems too thick. Stir and bring to a low simmer. Cook just until broccoli is tender and bright green, about 3 minutes. Season with salt and pepper. Serve. Ooooh, this looks good. Just the sort of cheesey warm comfort situation I’m into these days. Will be trying this out for sure. If I get broccoli from my CSA next weekend I’m making this! This makes me think of the microwave cheese broccoli I found and loved. This sounds so yummy and I am definitely bringing it to our Thanksgiving gathering this year. Do you have any tips about making it in advance? Hi Sue! My husband and I ate the leftovers for lunch the day after making this, and they were just as tasty as the night before. You should be totally fine to reheat this on the stovetop or microwave, maybe adding a few splashes of water or non-dairy milk if it seems necessary. The broccoli doesn’t look as nice on the second day, as green veggies always tend do get duller in color after being cooked. If you’re concerned about that you could prep everything else ahead of time and just add the broccoli when you reheat it the day of serving, and let it simmer for a few minutes until the broccoli is tender. Enjoy! Well, even though you delete comments that don’t fawn all over your recipes, I am still posting to ask how I can better make this recipe with white rice? I made it already because I am trying to clear out the rice from my pantry and the end product was very porridge-like and I only used about 1/2 a cup of milk. I still like this recipe because the potato and carrot mixture is very promising as a cheese substitute – I added a teaspoon of tahini to it and it was delicious. Way too much lemon juice, though. I will probably only use about a tablespoon next time I make this and maybe double the amount of white rice. I haven’t tried this with white rice, but I think it should work just fine. I just made this and 1/2 cup of rice was not near enough. It just disappeared or stuck to the pot. I also think it was too heavy on the lemon juice. I’m making this for dinner (yes, it will be THE meal) tonight!! It looks delicious! I made this last night, doubled the rice but not the rest (except for broth). Mostly because I get distracted while cooking and forgot ;) I ended up putting in a casserole dish and broiling with gf panko crumbs on top. Then I put it in the fridge because it was late and we had gone out to diner. It was fantastic the next day! My husband agreed! I think the miso is the secret ingredient. Thanks for the recipe, excited to try some more of yours! On nice! So you’re actually was a casserole! I have to try that next time. :) Glad you enjoyed it. Thanks for popping back over to let me know! I just made this and it turned out great! The only downside was that it took me about 2 hours total. The rice took very long to cook, and I ended up having to add another cup of vegetable broth. The only other thing that I did outside of the recipe was use red miso paste instead of white and top it with gluten free bread crumbs. Thank you! Thanks Justina! Glad you liked it! Okay, I must admit that prior to going Vegan, Broccoli Casserole was and will continue to be tradition for every holiday back in Tennessee- I just won’t be eating it. I now live in California and before going Vegan I made regular broccoli casserole for the most elite of palates and they would all go crazy for it. I just refused to tell them what was in it- lol! So! I tried this recipe yesterday and here’s I stand. If I had not been comparing to reg. Broccoli Casserole, I would say hey wow this is awesome! However, with the comparison I felt like something was missing and I want to figure out what that is and keep trying. But thank YOU so much for sharing this recipe as I think it’s a great start. Maybe some Vegan Mayo? And if I were to bake it next time- I would put raw onions in and maybe some self rising flour or arrow root starch/flour to make it rise a little. Maybe that would work. If I try it again I will let you know. I have a mushroom allergy – do you have any suggestions for a sub? Obviously nothing else is the same as mushrooms but usually I just sub in an entirely different veggie or use extra of what’s already called for. I’d love your thoughts as I’m not sure what other veggie would be a good fit in this but I’m dying to make it, it looks & sounds so yummy! Thanks so much. Hi Sarah! An extra cup or two of broccoli would work, or even cauliflower if you want to mix things up a bit. You could add it at the same time as the broccoli. I think finely chopped carrots might be nice too, but they might need a few minutes more of cook time than the broccoli, so maybe add them in first, give them a few minutes, and then add in the broccoli. I’d love to hear how it works out with any of these substitutions. :) Enjoy! Any thoughts on if this recipe would freeze well? Either before cooking it or after? I think you should be good to freeze it after cooking. I made this without broccoli added extra mushrooms. It sounded and looked like it could be more of a risotto consistency. I doubled the rice. While it was delicious I do feel like the measurements were off. I did not add any milk at all and felt even with the extra rice it was too runny/not enough rice. I made this tonight and had 2 bowls of it. It really hit the spot. Towards the end when it calls for 2 cups of milk, I only used one. Glad I did. I feel like I could’ve added more rice. All in all this was great. Very cheesy and scratched that itch. Thank you for sharing. I’m glad you enjoyed it!! Thanks Jason! Strangely the rice was a tad chewy and I will cook for one hour next time. Yay!! I’m glad you enjoyed it! Thanks Stephanie! yeah this needs to be retested and adjusted, i wish i had seen the comments first because i made it, added only 1 cup of milk and it is bland and not a casserole in any sense of the word. more like a soup. the measurements are way off and I was skeptical but i went through with it anyway and am really disappointed. I just made this, and it came out great. I don’t like mushrooms, so I substituted tempeh! I used a cup of already cooked rice (the frozen packets from Trader Joe’s that you just cook for a few minutes in the microwave), so I just used a little broth, to my desired consistency; same with almond milk. I also used 1/2 broccoli and 1/2 cauliflower. I didn’t have miso paste so I mixed a little soy sauce with tahini, and that seemed to work. I used a little more lemon than called for, plus a dash of tarragon. And I baked it in the oven for about 10 minutes at the end. Perfectly delicious! Wow! Great modifications! I’m so glad you enjoyed it! Thanks Dianne! This was mad tasty! Thank you for this! Yay!! Glad you like it! Thanks Steph! Awesome recipe. We don’t use oils, so we substituted for veggie broth. Glad you enjoyed it, and glad to hear it worked with broth! I made this tonight and while it didn’t come out as pretty as yours it sure is tasty! I used quinoa + sprouted mung beans so I could eat sooner and added in more broth. I used about 1.75 cups of homemade cashew milk. This is fantastic & healthy comfort food! I made this with exact ingredients and measurements and my rice just burned down to the pot and I had to add a ton of liquid to save it. It had only been about 15 minutes which is strange.. I am glad I stayed in the kitchen prepping other meals and smelled it “burning” or I would’ve had to trash the whole thing. The flavors are good but the measurements do seem a little off. The Vegan Broccoli Cheese Casserole is the first vegan dish I’ve made. I found it doing an internet search before going into the grocery store. I didn’t want to just have steamed broccoli again, and I didn’t want to eat a recipe with cheese or creamed soups because of recommended dietary changes. So, I found all ingredients but the miso paste, which I’ll get before trying this recipe again. … Yes, it’s good enough to eat again BUT DID NOT TAKE 10 MINUTES OF PREP. It took me ten minutes to peel and dice the potato and carrot and get them ready to boil. Next there’s dicing and sautéing the onion, cleaning and cutting the mushrooms, etc. Anyhow, two hours later, I had the dish. My whole family ate it with no complaints. When I told my son it was vegan, he said, “Then how’d you make it cheesy?” … I followed the ingredient measurements but only needed one cup of soy milk. This is super yummy and hearty for those chilly winter nights! I used white rice so it cooked in about half the time, and I also added a can of chickpeas at the end. Will be making this again. Thank you for the recipe! Chickpeas sound like a delicious addition! I’m glad you enjoyed it!